A 98-year-old man who received serious head injuries in a collision on Friday remains in hospital, police say. 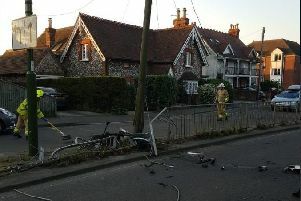 Police are appealing for witnesses to the incident, in which the man’s mobility scooter collided with a car. Officers were called to the collision in Middleton Road just before 10.15am on Friday. The road was cordoned off in two places and paramedics were called. Anyone who saw what happened is asked to contact Sussex Police online or by calling 101, quoting Operation Peldon.